With PowerGREP, you can maintain large sets of files and produce different editions of those files. The extensive backup options make sure you need not worry about losing important data when a certain action turns out to be unfortunate. Choose the file name style for backup copies that suits your habits. Give backup files a particular extension to set them apart, or prepend "Backup X of " to the file name so you can easily open backup files with the associated application. Or give backup files the same name as the original, placing them into a different location. Place backup files into the same folder as the original, or specify a specific backup folder to reduce clutter. Or place backup files into compressed archives to save on disk space. Use automatically numbered backup file names and backup locations to keep separate sets of backup files for each action modifying a particular file or set of files. 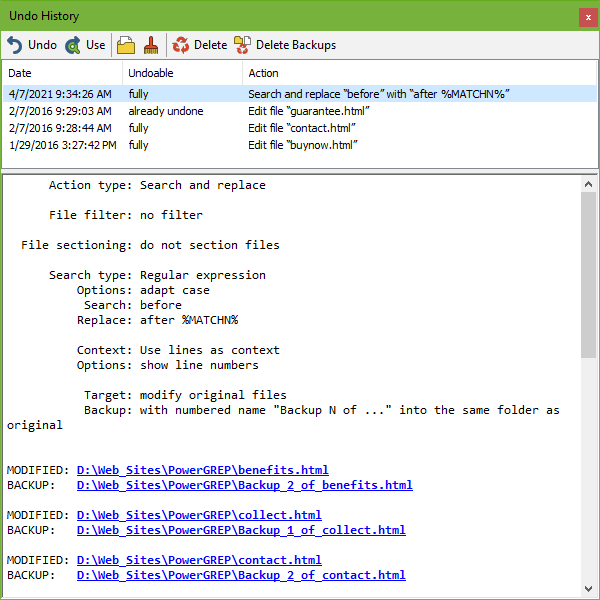 PowerGREP's Undo History pane automatically keeps track of which actions modified which files, archives, and folders as well as which backup copies were created. If something went wrong, you can undo any given action at the click of a button. The Undo History is persistent, even after closing PowerGREP or shutting down your computer. It is saved into a file of your choice. You can undo any action as long as you did not delete the backup copies. Cleaning up backups for any given action is just as easy at the click of another button. "I am currently using PowerGREP a lot. Mainly because of the multiple ways you can verify changes before committing to them. The multiple undo features are superb. My confidence and skill with regexes is really improving as a result."